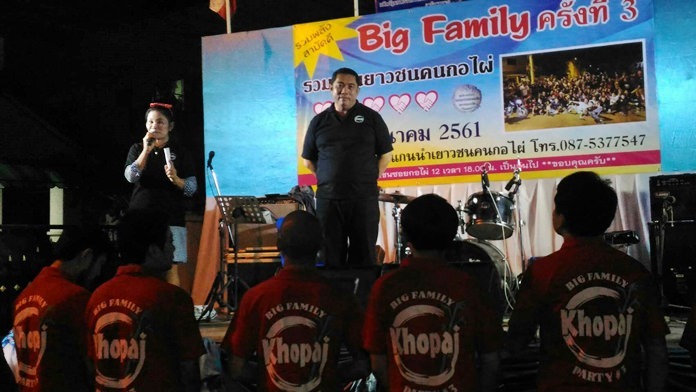 Former Culture Minister Sonthaya Kunplome presided over the opening of the Soi Korphai Community “Big Family” event to raise money for charity. Chonburi politicians and former MPs also were on hand for the March 8 event hosted by neighborhood president Wirat Joyjinda. The community has placed a major focus on local youths and believes their input is the key to creating unity in the community. Entry tickets cost 200 baht with profits going to the community’s social work projects. Those attending received food and drinks.